Start-up developer Here On Biz has released its new app that integrates chat and location awareness to LinkedIn through any iDevice. The program allows traveling professionals to locate other Here On Biz users around them and engage in online conversations that may lead to real-world meetups. 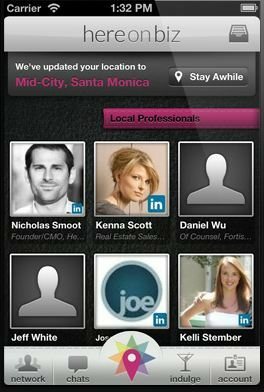 The connectivity between Here On Biz and a LinkedIn account gives users instant visibility to others around them and the ability to locate contacts by neighborhood. The ability to then begin an online chat sessions opens up the possibility of face-to-face business meetings or network building opportunities. Even Here On Biz users who are not current LinkedIn contacts are visible to each other, may invite one another on LinkedIn, and then begin chatting once the invitation has been accepted. To learn more about the new networking app, visit their website at HereOn.biz.